Conair, a leading supplier of auxiliary equipment for plastics processors introduces the new NCF Series super-tangential granulators, which feature footprint dimensions at least 30% smaller than many other granulators with similar capabilities. The cutting chamber configuration is ideal for handling lightweight bulky parts such as bottles, but also produces clean uniform granulate from runners and small parts. Different hopper designs and rotor/knife choices are available to maximize performance with a wide variety of scrap types. Four different models feature 8-inch (203-mm) diameter rotors, in widths of 10, 14, 19 and 24 inches (240, 360, 480 and 600 mm), and deliver standard maximum throughputs ranging from 150 to 450 lb (68 to 205 kg). The smallest unit is powered by a 5-hp motor and the three larger sizes have 7.5-hp motors with options to 15 hp. Standard rotor speed for the NCF 810 is 260 rpm and standard speed on the larger models is 400 rpm, although 260-, 400- or 840-rpm can be specified on any of the granulators to increase capacity, improve regrind quality and/or minimize energy consumption. 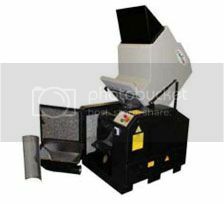 A tilt-back hopper and drop-down screen cradle provide easy access to the cutting chamber for maintenance and cleaning. Conair said that these features contribute to increased productivity and reduced downtime. An optional sound attenuation package also makes the NCF Series quieter than other small granulators. The super-tangential chamber design ensures that the rotor grips bulky scrap on the downward stroke, drawing it into the knives and preventing it from bouncing on the rotor. Standard tangential and straight-drop in-feed configurations are also available. The rotor itself can be open with three rows of double-angled knives for a clean scissors cut with minimum heat generation. For tougher materials, a solid rotor can be equipped with three rows of up to five cassette knives in a staggered array. Cassette knives allow for quick and easy knife changes and minimize downtime for service and maintenance. The knives require no adjusting to maintain a consistent knife gap for improved quality.